This novel shipment included things like an earthworm harvester, a compost tea brewer, a no till seed drill, a crop spray cannon, flail chopper, organic fertilizer, and microbial inoculants. When working in concert, these now tools and materials will help further our work of improving the health of our soils. Our Agronomy Technician Kaniela Lind wasted no time firing up many of these new tools for a test run. Above you can see Alvin Kaiwi and Kaniela running the earthworm harvester that removes earthworms from a finished batch of vermicompost. Vermicompost is compost made with the help of earthworms, the harvester helps to remove the earthworms before we spread the compost so they can keep making more vermicompost. The high quality vermicompost we make contains billions of beneficial soil microbes per teaspoon. In this composting process variety of organic materials from the ranch including paper, cardboard, and crop leftovers are transformed into a homemade concentrated organic fertilizer. 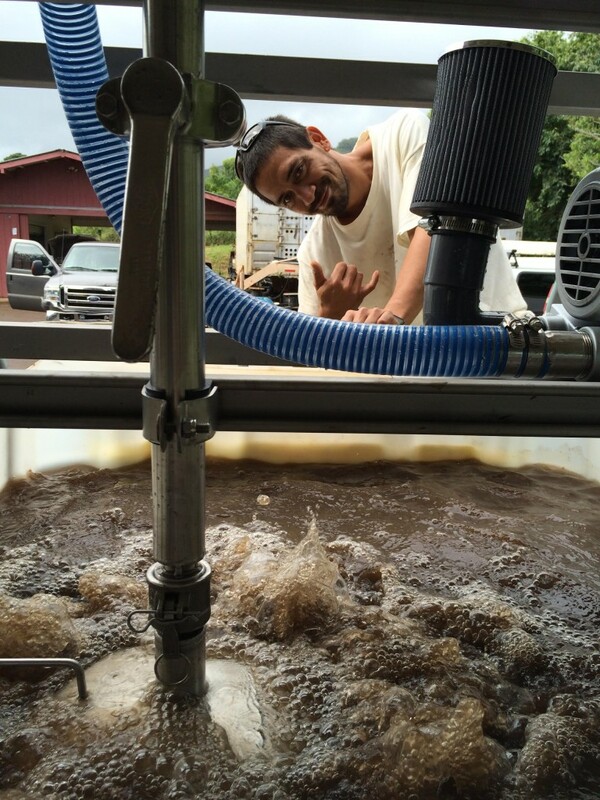 Next, Kaniela loaded up the processed vermicompost in our new compost tea brewer to make our first “brew” and added materials such as kelp, liquid fish, humid acids, and wheat flour to feed the microbes and allow them to multiply in the oxygenated tea. Compost tea is then sprayed on the leafs of the plants and watered into the soil. It works like a probiotic for plants, helping to protect our crops from disease and aids the uptake of nutrients. This tea was then applied to our new citrus orchard planting to help supercharge the trees and boost their growth organically.